spoony for logophiles: kitty lost, kitty found!! yesterday, my productivity was deteriorating so much that my boss basically ordered me to go take a nap. when he came to check on me and make sure that i didn't feel like i got "sent to my room" he found me crying, having just got off the phone with cody to tell him that ouizie was missing. 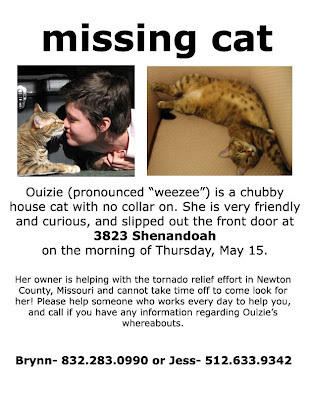 my boss and i talked and came up with a compromise that included me working remotely from st. louis to make any forms or fliers needed by the team in neosho, and also being allowed the time to go look for ouizie. last night, i got to st. louis about midnight, and as soon as my ride drove away after dropping me off at home (because i forgot my car keys in the 15 minutes i had to pack for the weekend), ouizie started crying for me. i couldn't figure out where it was coming from because it was so loud, it was bouncing off the houses, so i started calling out her name, and it was back and forth until i saw her on the sidewalk running toward me. she found me. her agoraphobia seemed to have been completely wiped away, as she roamed the porch freely while i waited for my roommate to bring me spare key to the house. ouizie almost seemed to be in guard dog mode as she sat out on the front edge of the porch watching cars go by. she also seemed to have found herself a boyfriend, whom she stared at with body language that looked like she was ready to elope with the other cat... but she stayed by my side, purring and snuggling and peeking in the glass of the front door, wanting to get inside and roaming the porch playing guard kitty. behold: the awesomeness that is my job.